The more I research health and healing for my blog, the more concerned I have become about the additives and chemicals in our personal care products. Add into the mix an ongoing mold infestation plaguing everyone in the family and I became determined to find some substitutes. (My body was so infected my skin had turned red and blotchy all the time and flushed even more when I used commercial moisturizers, cosmetics or ate too many carbs - mold loves sugar and refined carbs). I have found that not only do these moisturizers feel great, they have been quite healing for a variety of skin issues. My sister swears that after rubbing the face moisturizer into her cuticles each night for a couple of months her nails are stronger. Essential oils are powerful and interact with plastic, so it's important to store the moisturizers in glass containers. Light can break down oils, so colored glass is preferable. I buy these cute blue 2 oz jars on Amazon from Love Essential Oils and they are just the right size. You save money when you buy a few extra, but you don't have to. I buy 12 at a time and found these moisturizers and sprays make great stocking stuffers or hostess gifts. These moisturizers are easy to make, but I'm lazy so I like to make enough of each moisturizer to fill 4 jars. As with my food recipes there are no hard and fast rules - add a little more or a little less as sounds good to you. Other people get fancy and add shea butter and/or bees wax, but so far I've just stuck with coconut oil as the base. First and foremost - if you have pets - ESPECIALLY cats or birds - educate yourself before you begin using essential oils.They are powerful and used improperly can cause liver damage in animals. I highly recommend this book written by a veterinarian "The Animal Desk Reference II: Essential Oils for Animals." There are also Facebook groups with great info - always look for those that rely on 3rd party testing (see below). Not all essential oils are created equal. Because we have a bird and dogs in the house I have been very concerned about safety as essential oils are very powerful. I belong to the FB group "Essential Oils for Parrots" and the moderators follow safety testing very carefully. The only recommended oils out there are Young Living, Do Terra Rocky Mountain Oils, Eden's Garden and Plant Therapy - and this is important - ONLY buy from a member or directly from the company. You cannot get pure oils at any store (no matter what the label says) and there apparently have been many documented cases of people buying the above brands on Amazon only to find that they have been adulterated with synthetics and fake fragrances. Essential oils are becoming very popular and finding someone in your area who sells them shouldn't be too hard (it works like Mary Kay or Avon). We are using them enough that it made sense to buy the starter kit and become members of Young Living - then you get the oils at a discount. Also, essential oils can react chemically with plastic and can break down and lose potency when exposed to sunlight, so it's important to mix all recipes in glass bowls and store your creations in colored glass jars and spray jars. 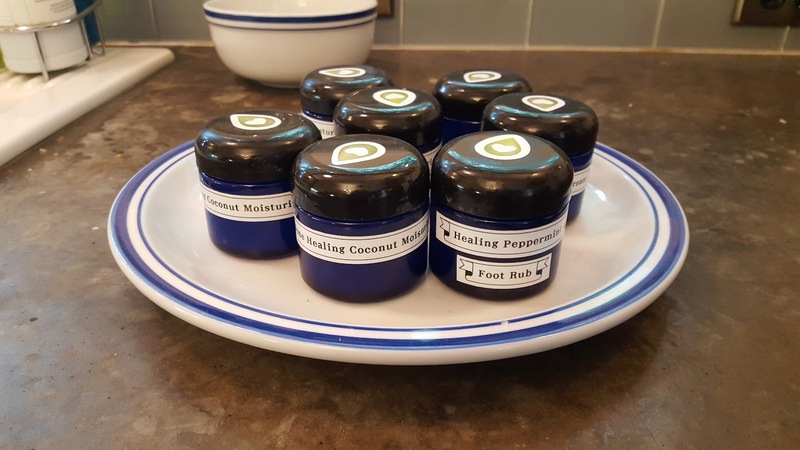 I like this little company I've found on Amazon - all bottles/jars shown in this blog are from them - here is their website. Place glass bowl on scale and zero out (so you are not measuring the weight of the bowl). Add 7.5 ounces of coconut oil. Place bowl in double boiler and turn on low hear. Stir occasionally until coconut oil is just melted. Turn off heat. Add essential oils as directed in below recipes and stir gently. Fill jars and let sit on counter to solidify. If it's too warm and they're not firming up, you can put in fridge until they do. Screw on tops and store in dark cool place (not too picky - mine live under the sink in the bathroom with the one I'm working out of on the vanity). So far, I've had no problem with spoilage. (The odd ounce numbers are meant to give you enough room to add the oils and fill 2 ounce glass jars. If you have jars of other sizes scale up or down). My Daughter and I use this daily before we put our shoes on. Keeps feet smelling sweet! 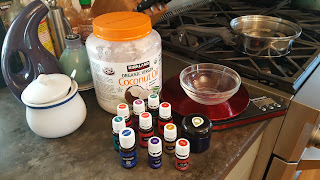 Stir together in a glass bowl, transfer to small spray bottle I use these. This is a more concentrated version of the above for really painful areas (I use it for my chronic pain). Because it is concentrated it remains in liquid form and it can be rolled on. It also means it can irritate the skin if you are sensitive, so use on a small area first. You can buy a roller bottles, or just the rollers (Young Living sells them - I assume other companies do to) and you can put this in a used empty essential oil bottle and put a roller on it - which is what I do). Experiment - you might need/want more of any given oil. Lately I've been adding more Valor. I made this for my massage therapist when both his mom and step-mom had heart surgery a few weeks apart. I've also given it to a few people who've had bad falls with lots of bruising. It seems to help some with the pain too. If it's a bad bruise (bruises) I would up the Frankincense. I made this for a 93 year old friend who's broken wrist was not healing quickly or well. I'm not sure if it helped or not, but it did supply some pain relief and moisturized her had and wrist when she needed to wear a daily brace for months on end. If I was doing it again, I might add Melrose (a Young Living blend) and or some Frankincense. *The point of a double boiler is to keep the coconut oil (or chocolate in a dessert recipe - yum!) off direct heat. All you need is a heat proof bowl suspended in or over a pan full of water. You can either have a bowl big enough to sit on the edge of the pot or have something in the bottom of the pan for the glass bowl to sit on. Essentially you are melting the coconut oil in a water bath. Very cool post! I've been wondering how you were making all of this stuff. Now I know! Great share!!! !